✔ All new designed intelligent fans, main fan noise reduced by 30%. ★ Warm Prompt ★: For the driver download link of this smart laptop cooler, please check the Quick Start Guide, if you have any questions, please be sure to contact us, thank you. 1) Strict Quality Control (100% Tested): In order to provide buyers with a pleasant shopping experience, each item has been carefully inspected and properly packed before sending out. 2) Fast and Professional Service: We have professional after-sale service team, any questions or problems from buyers will be answered within 24 hours (Including holidays). 3) 12 Months Warranty and 100% Money Back: We provide 12 months warranty service for all of the products we sell on Amazon, if you are not satisfied with our products, we can give you a 100% refund. 4) Continuous Product Improvement and New Product Release: Maybe our products are not perfect, but we will continuously improve them according to customer's reviews and feedbacks, to provide our customers a better product experience. We have professional R&D team, will continue to launch new products to meet customer needs and enhance our market competition ability, thank you for your supporting! ◉ Unique Ultrathin Design: Specially designed for Alienware 17R4 AW17R4, with Aluminium Alloy Shell and ABS bracket, fine workmanship, AA15 anodic alumina surface treatment. 6.1° tilt angle design, ergonomic comfort. ◉ BUILT-IN SMART CHIP, INTELLIGENT SPEED CONTROL SYSTEM: Built-in smart control chip, it can detect the hardware occupancy rate of current PC, then adjust the fans speed intelligently, which can save your energy. ◉ 4 High-performance Fans: 2*80mm DC brushless fans (Speed up to 5000rpm); 2*50mm DC brushless fans (speed up to 8000rpm), maximum cooling effect up to 20°C or more, it can solve the drop frame problem due to CPU overheating when playing games. ◉ Amazing RGB LED Lighting System: 14 common colors options and 2 patterns available: Static pattern (No flash) and breathing pattern. ◉ Compact in Structure: Dimensions: Length: 15.7in., Width: 4.3in., Height: 1.9in. 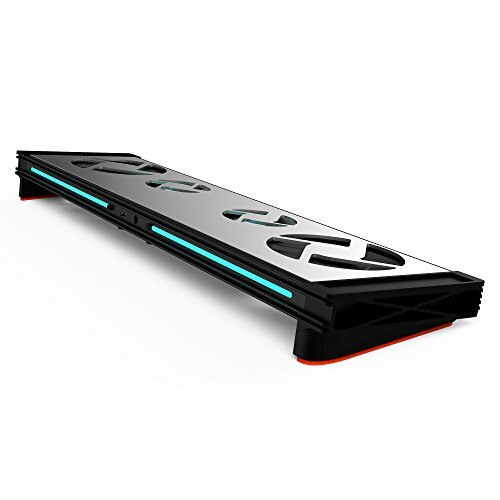 ; Net weight: 2.1lbs (Including power adapter and USB cable), easy to put in your Alienware backpack. If you have any questions about this product by Advancing Gene, contact us by completing and submitting the form below. If you are looking for a specif part number, please include it with your message.